Eling Tide Mill is the only original tide mill in the country still open and working as it has done for centuries. 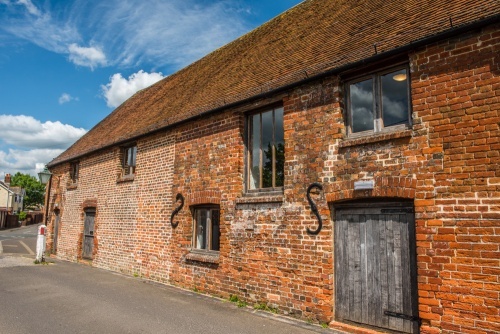 Situated at the edge of Southampton Water, Eling mill dates back to the 11th century. The current mill is a comparative youngster, built in the late 18th century. The mill at Eling carries on a 900-year-old heritage of milling by using the power of the tide. We know that there has been a mill on this site on the edge of Southampton Water since at least the time of the Domesday Book in 1086. The Domesday Book mentions a mill at Eling, but even that may not be the first mill on the site, for there is reason to believe that the Romans had a mill here as early as the 3rd century AD. If true, any remains are buried deep beneath the current mill and will probably never be found. Since Eling was a royal manor after the Norman Conquest, the mill was officially royal property. King John, who always seemed to be short of money, sold the manor and mill in the early 13th century. Then in 1382 it was purchased by the powerful Bishop of Winchester and granted to Winchester College. For the next 597 years, Winchester College owned Eling Mill, though they did not operate it themselves but leased it to a succession of tenant millers. It must have been a profitable operation for millers, for the proximity to Southampton Water meant that grain could be easily brought here from a great distance, and by running a pair of water wheels the mill was capable of grinding up to 4 tonnes of flour per day. 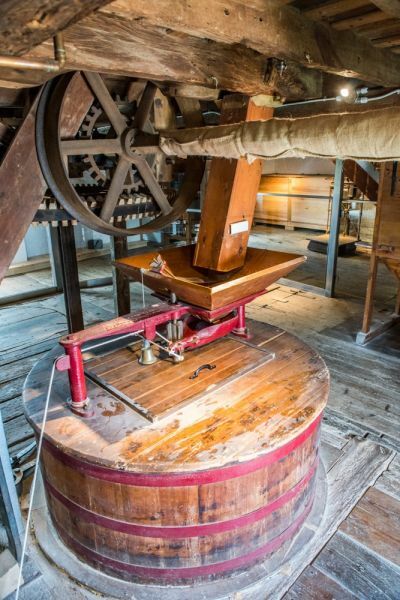 The mill would have been rebuilt numerous times over the centuries, but the last major rebuilding came in the 1770s after storms and floods damaged the equipment. So the mill buildings are 220+ years old, though the restored milling machinery dates to 1892. The mill was reduced to grinding grain for animal feed in the early 20th century but remained in production until 1946. It was then restored and brought back into production as a living museum beginning in 1975. One of the waterwheels was restored to full working order, but the other was left as it was so that visitors can get a closer look at the machinery. 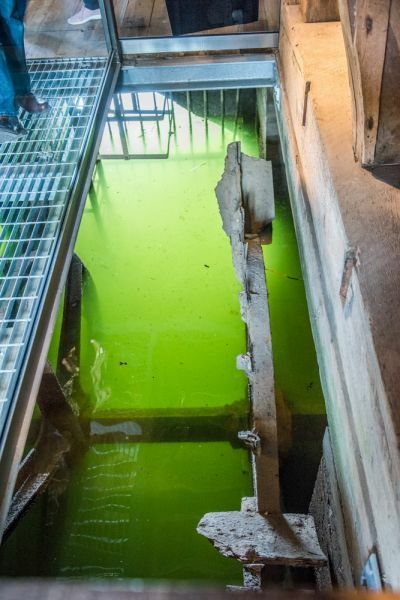 How does a tide mill work? To harness the movement of tidal water a dam is built across the river. When the tide rushes in, it pushes open a series of one-way gates and fills up a mill pond on the far side of the dam. When the tide turns and begins to recede downriver, the water is trapped in the mill pond. 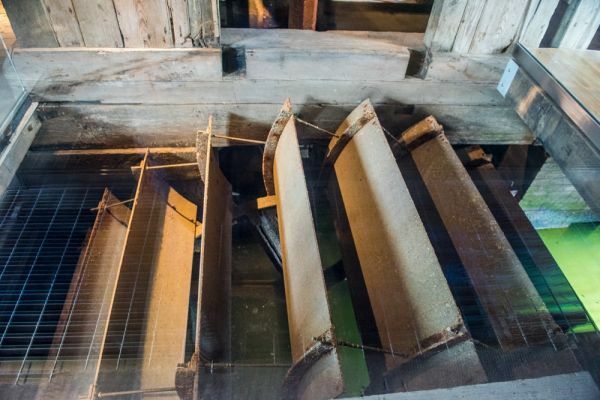 When the difference in water level is high enough, a sluice gate is opened, sending water onto an undershot waterwheel, where it catches the lower blades, and spins the wheel. 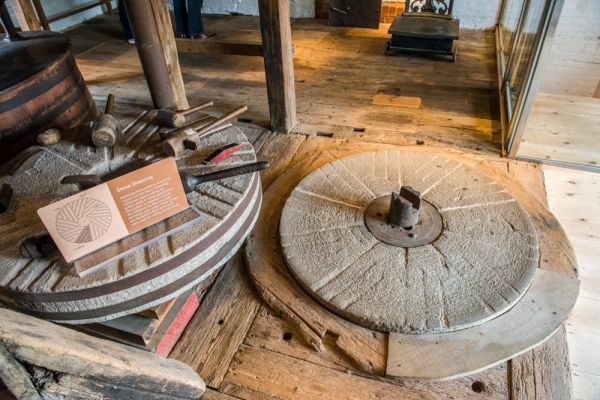 The wheel is linked to a drive shaft, which in turn powers grinding wheels to mill grain. Visitors can see grain being milled by harnessing the power of the tide and buy freshly milled flour. 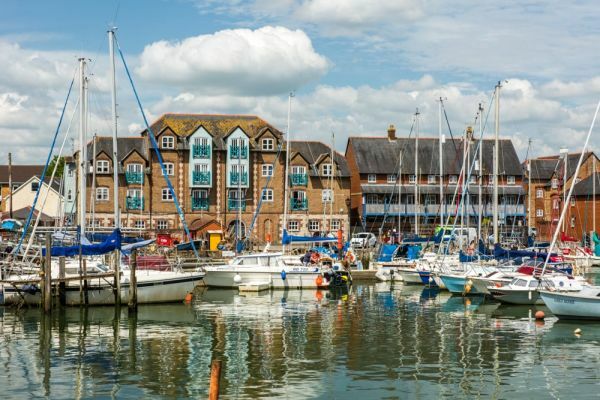 Obviously, the milling times depends on the tide timetable, so it is a very good idea to check the mill website for timetables before making a special trip. Of course, you can still visit the mill and see the milling machinery at any time, even if the tide is not cooperating! When we visited the tide was out, so no milling was taking place, but we could still see the water wheels and milling mechanism up close. Eling Mill grinds 2 main types of flour; a stone ground wholemeal flour from local grain, and an organic breadmaking flour from grain imported from elsewhere in England. Across from the mill itself is the Eling Tide Mill Experience, a combination tea shop and information centre with exhibits showing how the tide mill functions, including a working model that lets you control the flow of tide water to the mill wheels. There are also displays on the history of the mill and exhibits of historical artefacts found on the mill site and the surrounding area. 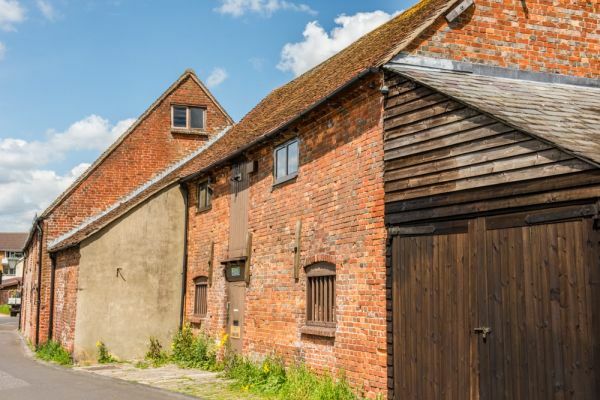 The Eling Tide Mill is a fascinating relic of a bygone age, and it is amazing to think that there has been milling on this site for well over 1000 years. 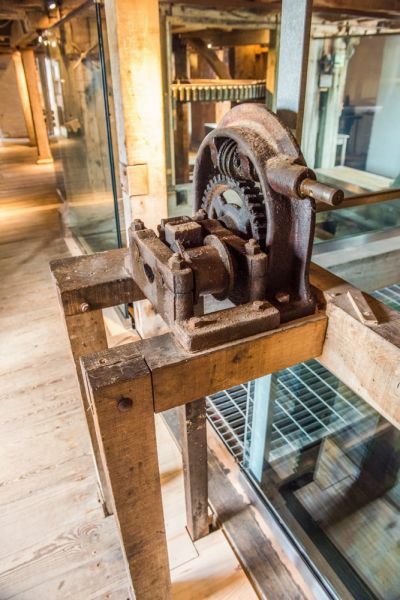 The mill has been beautifully restored, with three levels open to visitors. At ground floor level you can see the two water wheels - one restored and fully functional and the other unrestored - and the drive mechanism that sends power from the water wheels to the grindstones on the floor above. You can also see the sluicegate mechanism that controls the flow of water to the wheels. From the ground floor, you climb a set of stairs to the stone floor, where the grain is ground into flour by a pair of griodstone sets. Here you walk directly through the huge gears that transfer power from the water wheels below to the stones. There are also several examples of milling machines, such as a 19th-century Kibble Crusher, and you can see grindstones in the process of being 'dressed', or recut. From the stone floor, you climb the stairs to the bin loft under the eaves. Here the grain is kept in large hoppers, ready to be poured down chutes to the grindstones below. You can approach Eling from the north or the south, but the southern approach is much easier. The mill is well signposted off the A326, reached via Junction 2 of the M27. Just follow the brown tourist signs and you arrive at a large, free parking area at the southern end of the Eling toll bridge. If you arrive from the north you have to pay the GBP 1.00 toll to cross the bridge and reach the parking area. From the parking area it is a very short stroll over the bridge to the mill.